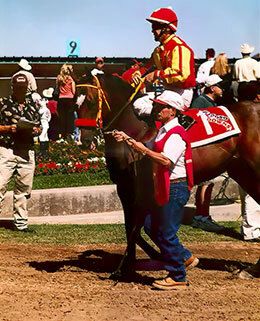 A Delightful Legacy, under champion jockey Joe Badilla, Jr., after winning the 2003 All American Juvenile at Ruidoso Downs. WAYNE, OK—MARCH 17, 2019—All American Juvenile(RG3) winner and champion producer A Delightful Legacy died Saturday. She was 18-year-old old. "A Delightful Legacy. . .her name says it all," Meridith Copeland, granddaughter of the mare's breeder Gwendolyn Eaves, said in a Facebook post Saturday night. "I love this girl and all she represents." Bred and raced by Gwendolyn Eaves and owned by the Eaves Family Horse Partnership at the time of her death, A Delightful Legacy is a daughter of all-time leading sire First Down Dash. "This girl’s conception was a new adventure for Gwen Eaves. My Mimi had NEVER considered an expensive stallion contract in her breeding career," Copeland said. "The winning purse money from A Delightful Dasher and Hes My Dasher, along with the encouragement from my dad, Randy Geiselman, prompted her to breed her 1999 Broodmare of the Year Fortune Of Delight to First Down Dash." On Labor Day 2003 when A Delightful Legacy won the All American Juvenile at Ruidoso Downs, her time of :21.057 seconds for the 440 yards was faster than the $1.89 million All American Futurity(G1) clocking on the same race card. A Delightful Legacy became one of the industry's leading broodmares following her race career. "The moment she hit the wire, she would hit first gear and barely make it to the turn," Copeland said of A Delightful Legacy's race career. "She would not waste one extra step. She would trot back immediately for her win picture and celebration dinner." As a broodmare A Delightful Legacy has produced 32 named foals, 26 to race 18 winners, 18 ROM, 6 black type including two-time AQHA Racing Champion and multiple grade 1 stakes sire Inseperable SI 96 ($672,756, All American Derby-G1, Rainbow Derby-G1, etc. ), Grade 3 winner and first-crop sire Seperate Interest SI 98 ($486,761), stakes winner Tell Of The Past SI 90 ($62,409), G1-placed Jess Before Dawn SI 95 ($152,328), stakes-placed and All American Futurity(G1) finalist Teller No Lies SI 102 ($103,942), Grade 1-placed Political Nonsense SI 96 ($51,688), etc. 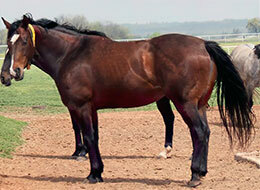 She is also the dam Hobbs America Futurity(G2) winner Chainman SI 88 ($188,217), etc. Also a homebred for Mrs. Eaves was the second dam Fortune Of Delight SI 107 ($100,269), by Six Fortunes, a stakes winner and former Broodmare of the Year. Out of Mrs. Eaves foundation mare Our Third Delight, Fortune Of Delight is a half-sister to Champion and leading sire Tres Seis SI 97 ($856,901) and Champion and leading sire Dean Miracle SI 104 ($199,60), and five other black type runners. Fortune Of Delight is the dam of 16 winners, 17 ROM, 7 black type including champion and All American Futurity(G1) winner A Delightful Dasher SI 102 ($1,660,525), champion and Rainbow Futurity(G1) winner Hes My Dasher SI 102 ($575,774), etc. Most of the black type winners in this family were campaigned by Ms. Eaves. "A Delightful Legacy taught me to fight for my grandmother’s integrity and welfare of her horses, Copeland says. 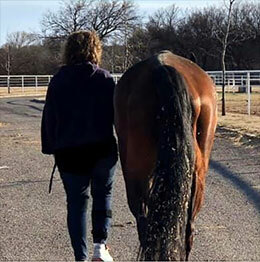 "Legacy taught me to research medications, treatments, and labeled me as a "high maintenance" mare owner. Copeland said A Delightful Legacy brought the Eaves Horse FLP to James Ranch. Additionally, Copeland's daughter Mimi Cate Copeland followed Starlite Delight (a sister to Inseperable and Seperate Interest) from a racehorse career to the AQHA show ring. She will continue to show as a youth and has ambitions to become an equine veterinarian, specializing in sports medicine/surgery. "Thank you, God, for allowing us the privilege of this precious creature," Copeland said. A Delightful Legacy is buried near a pond on James Ranch near Wayne, Oklahoma.